Nexus Arts, Lions Arts Centre, Sat 3 Nov. The evening’s music starts with an ensemble local musician Lyndon Gray has put together and it features jazz inspired by Carnatic (an Indian style) of rhythms. An idea quite suitable for a public airing at OzAsia! Clearly jazz, and very well played by all of the musos (double bass, trumpet, piano, electric guitar, saxophone and drum kit) – each of whom is more than capable of holding their own in the solo spaces made available. The audience were, at least for the most part, jazz aficionados and they were clearly in their element with the set consisting of three pieces; the first is an extended piece with solos all round, the second is a pulled-back duo between piano and bass, and then all back for the relatively brief finale. It was an enjoyable set with some real pizzazz on the stage! On the stripped-back duo track I’m not sure why the percussionist didn’t play with the duo, instead choosing to use a percussion box to play the beat. As for the Carnatic rhythms meet jazz, for mine it was an interesting exploration and idea but some Indian style percussion would have added a little more soul rhythms (not in any way taking it away from some very accomplished percussion!). In any case it was a very solid introduction set. The Three Seas is a project idea from band leader Matt Keegan to meld jazz with Indian, in particular, with West Bengal music. 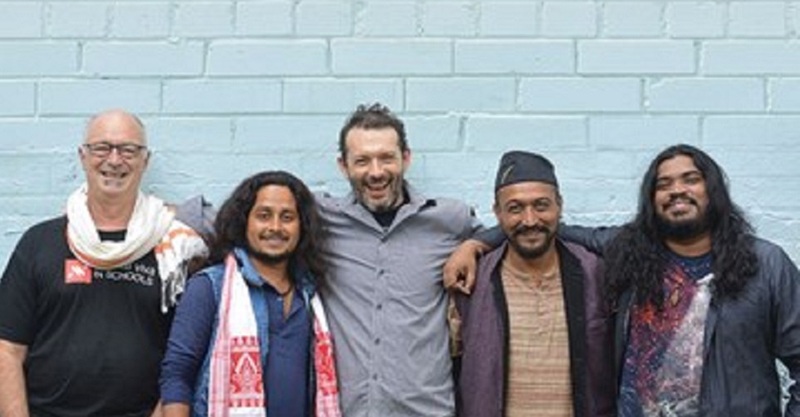 In this case, three Indian musicians (Gaurab Chatterjee on percussion and drums, Deaoashish Mothey on stringed instruments and vocals, guitar and Jew’s harp and Raju Das Baul) are a part of the ensemble, along with Matt on saxophone and Steve Elphick on double bass. Steve’s bass playing by hand or bow is superbly innovative and blends beautifully into the Indian styles and songs. Of course the double bass is naturally capable of micro tones and the like – how Matt makes the two meet on sax I’m simply not sure! The group have a great sound; it is something akin to the best you might see at a WOMAD Festival, although you get much closer in Nexus Arts. There is a colourful and fabulous sounding mix of instruments and the joy on the stage is palpable. And that’s all before Raju Das Baul – singer and khamak player – enters the stage! He is charisma personified when performing; simply delightful and uplifting! There were no slouches on the stage at all; this was a fabulous set, great songs, variation, dynamics and audience engagement. Studying the audience, it was clear that some weren’t quite sure what to make of the considerable and significant steps that the jazz had taken towards West Bengal, while others were immediately very appreciative. Notwithstanding by the end of the gig the entire audience, were very keen on more, but sadly no encore was forthcoming. An alluring meld of jazz with Indian, in particular, with West Bengal music.